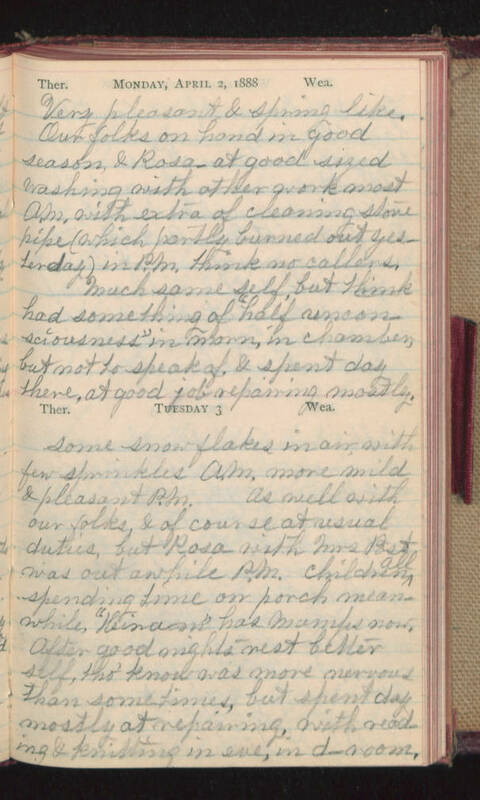 Monday, April 2, 1888 Very pleasant & spring like. Our folks on hand in good season, & Rosa- at good sized washing with other work most A.M. with extra of cleaning stove pipe (which partly burned out yesterday) in P.M. Think no callers. Much same self, but think had something of "half unconsciousness in morn, in chamber, but not to speak of, & spend day there, at good job repairing mostly. Tuesday 3 Some snow flakes in air with few sprinkles A.M. more mild & pleasant P.M. As well with our folks, & of course at usual duties, but Rosa with Mrs Post was out awhile P.M. Children all spending time on porch meanwhile, "Hiram" has mumps now. After good nights rest better self, tho' know was more nervous than sometimes, but spent day mostly at repairing, with reading & knitting in eve, in d-room.